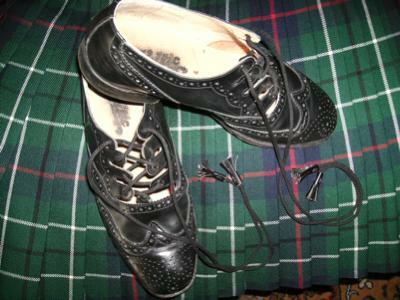 Kilt Shoes, an important accessory worn under kilts. 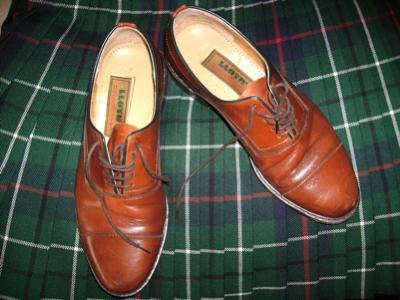 There are several different types of kilt shoes, and by far the most famous are the Gillie Brogues. These are unbelievably comfortable, and one of the main reasons for this comfort is that they do not have a tongue. The name is derived from the word Gillie, who is a shooting and fishing guide in both Scotland and Ireland. They were specifically designed without a tongue, so that when the wearer stepped into soft peat on the Scottish or Irish moorlands he would not be left barefooted, as it is laced up to well above the ankle. Another very practical reason for not having a tongue is that it allows them to dry out very quickly if they become wet. Since their development for use on the moors, they have been adopted as the most widely worn for evening or formal wear, and are now considered by many as an integral part of the Highland Dress. The photo below shows my Gillie Brogues, which are by far my favourite footwear of all. Another popular variation for formal wear is the kilt Brogue with buckle, which is available in both standard or the very dressy patent leather. Yet another option if you want something just that little bit special, is a pair of hand made Culloden Shoes with matching Buckle. These are fashioned after the typical style which was worn in the early to mid eighteenth century. For day wear a normal pair of good quality Brogues are usually worn, as in the photo below. More and more people today are choosing to wear their kilts as casual wear, and in this situation often choose hiking boots as accessories to their kilt. This option is both comfortable and functional. If you have any further questions or queries on this particular subject, or indeed any question relating to any of the content on this web-site, please don't hesitate to contact me using the Contact Us page.